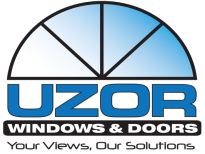 Windows - Uzor Windows & Doors Inc.
Low-E- Low-E is a high performance, energy efficient glazing package designed to perform in norther climates. this coating allows solar energy to pass through thereby heating your home in the winter. Fusion Welding- All sashes and frames are heat welded at corners for additional strength. Multi-chambers act as dead air insulators while additional chamber walls provide greater weld surface area. Quality PVC Extrusions- Sash and frame extrusions formulated with PVC and performance additives will not crack, chip, peel or warp and are fade resistant. All sashes and frames are extruded using virgin vinyl. air space systems and Argon gas filled insulated glass units. lasting thermal performance and comfort year round. use even in the harshest climates.